Working with individual stocks, diversification reduces company-specific (idiosyncratic) risk that comes from earnings surprises or other bad news that can affect individual companies. A carefully selected (no strong biases) portfolio of 50 or more stocks will diversify away most idiosyncratic risk. The main benefits from more diversification are reduced benchmark tracking error and an increased ability by active managers to handle larger amounts of capital. Investment managers often want to reduce tracking error for reasons of job security and to trade larger amounts of capital to receive more compensation. But from an investor’s point of view, larger portfolios are no better than smaller ones once you eliminate most idiosyncratic risk. Larger portfolios may, in fact, be worse than smaller ones in offering up profit opportunities. Active managers might better serve their clients’ interests by having more focused portfolios of their best holdings rather than diluting their portfolios with less attractive issues. Investors wanting broader-based portfolios can buy less costly index funds. Over diversification is a problem especially for momentum investors because studies show that momentum profits are highest in the most concentrated momentum ranked cross-sections of the market. 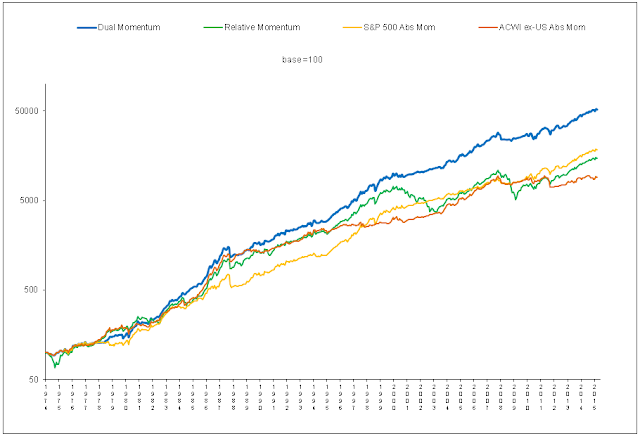 Top momentum deciles outperform top momentum quintiles, which outperform top momentum terciles. There is a significant reduction in expected return from a momentum portfolio as the number of stocks in the portfolio increases. Yet, as I point out in my blog post “Individual Stock Momentum – that Dog Won’t Hunt”, there are some momentum funds that own half their benchmark universe of individual stocks. Investors in those funds are paying for what amounts to an index fund plus a modest exposure to momentum. Over diversification can also be a problem with asset class momentum. To better understand this, you need to consider how investors earn their profits. Investors are compensated for giving up use of their capital (which can earn them the risk-free rate) and for bearing risk (which can earn them a risk premium above the risk-free rate). Companies receive and use invested capital for productive purposes when equity investors become beneficial owners of these companies. Stockholders share in the fortunes or misfortunes of such companies and are compensated with a high risk premium. In fact, among all investment opportunities, stocks (especially U.S. stocks) have offered the highest risk premium. 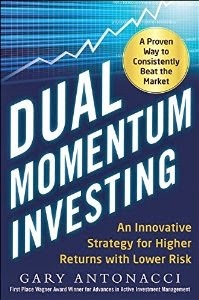 Those who have trouble accepting the evidence that I present in my book, Dual Momentum Investing: An Innovative Strategy for Higher Returns with Lower Risk, should read Stocks for the Long Run by Jeremy Siegel. He devotes most of his book to that subject. Bonds also provide a risk premium, but one that is substantially lower than stocks because bond investors have a senior claim on company assets and are guaranteed a return of capital when their bonds mature. It is uncertain what kind of risk premium, if any, investors in assets other than stocks and bonds receive. For example, investors in aggregate commodity futures (a zero-sum game, less transaction costs) once received plenty of risk premium from commercial interests looking to hedge their business risks by using those markets. But with the proliferation of speculative commodity trading, as well as a large number of institutions adding passive commodities to their portfolios, much of that risk premium has now vanished. One might sometimes still earn short-term speculative trend following profits from assets other than stocks and bonds, but the odds are much better having a proven risk premium behind you as a tailwind. The main reasons investors continue to hold assets other than stocks and bonds is the mistaken belief that more is always better with diversification and that holding less correlated assets will lessen portfolio volatility and reduce bear market exposure. But bonds can be just as risky as stocks, and stocks and bonds are not always negatively correlated. 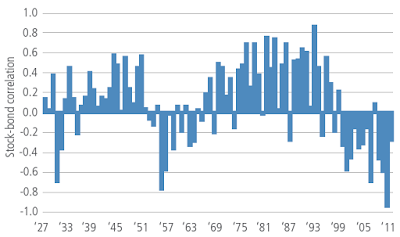 Here is a chart of the correlations over time between U.S. stocks and 10-year Treasury notes. Many markets that were once non-correlated now move together under economic stress. Diversification can fall short when it is needed the most. With increased globalization, the world is now much more inter connected. Widespread diversification is no longer as useful as it once was in reducing downside risk exposure. What is useful for that purpose is trend-following momentum, which has shown the ability to both enhance returns and reduce downside exposure among different assets going back to the turn of the last century. The effective downside protection offered by absolute momentum is even more reason why over diversification is unnecessary for momentum investors. A better approach, as presented in my book, is to invest in the stock market when it is strong to capture the highest amount of risk premium. When stocks are weak, you switch to bonds which offer a more modest risk premium than stocks. Since the stock market is a leading economic indicator, a weak stock market can indicate a future economic slowdown, declining interest rates, and a healthy bond market. So stocks and bonds should complement each other at the most appropriate times. This is a more effective approach than having a permanent allocation to both. Diversification into asset classes with lower risk premiums dilutes long-run returns and leads to investment mediocrity. 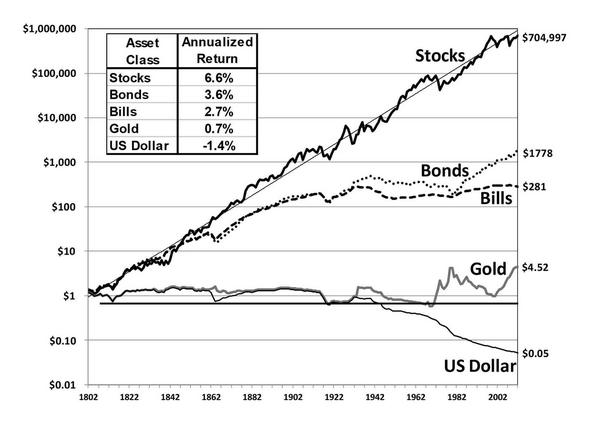 See "A Century of Evidence on Trend Following Investing" by Hurst, Ooi, and Pedersen. Our Global Equities Momentum (GEM) model stays mostly in U.S. stocks. It switches to non-U.S. stocks when the odds shift in their favor according to relative strength momentum. For validation of this switching approach, see http://awealthofcommonsense.com/avoiding-recency-bias-foreign-stock-markets.